The other occurrences in recent history are October 2007, February 2007, November 2006, April 2006 and February 2006. The only instance which did not result in either a correction or a sideways rangebound market was November 2006 when the S&P 500 index continued to rally right into February 2007. While this is high, we are looking for an even more lopsided scenario with three times as many bulls as bears. This is what we saw at the market top in the recent top in April. 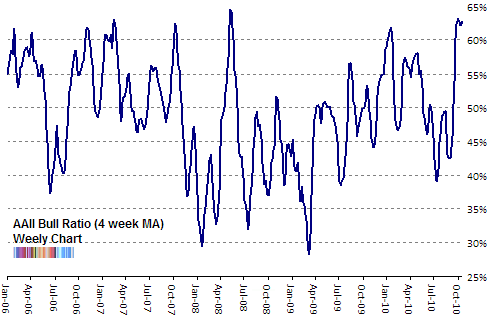 This week the survey of manager sentiment from NAAIM was little changed with the median exposure still at 80% long and the mean or average climbing slightly to 72%. 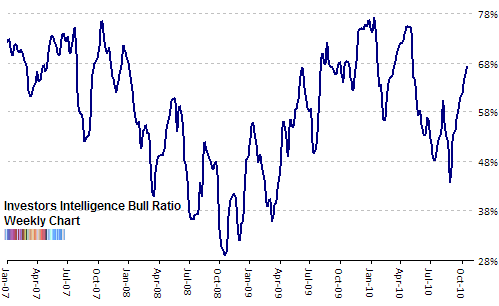 We don’t have a lot of data for this sentiment survey since it started just four years ago but we’ve never seen a market top correspond to this level of bullishness. For a chart, please see last week’s sentiment overview. According to the latest ML survey of institutional managers, portfolios are taking on more risk with a net 27% overweight equities (compared to net 10% in September). Managers are continuing to underweight bonds and put their cash to use - just 6% are overweight cash compared to 18% last month. Most of the money destined for equities is flowing into emerging markets - a 17% point increase in managers overweight emerging markets from last month (to 49% net). As well optimism about China’s economic ability to grow is ramping up. Now a 19% expect China’s economy to grow, an 8% point increase from September’s and a 19% point increase from August. Regarding the dollar, a net 45% believe it to be undervalued (and increase from last month’s 18%). But only 12% expect the US dollar index to be higher within 12 months. On the flipside, 45% believe the Euro to be overvalued (compared with just 17% last month). And when it comes to gold, 24% (double the level from last month) believe it to be overvalued. Company executives, directors and large shareholders (those considered “insiders”) have started to sell with last week’s sell to buy ratio reaching 5.29 according to Vickers Weekly Insider Report. Some of that intense selling may be due to pent up supply which was restricted from entering the market due to the earnings season. According to data from ICI this week we saw an additional $623 million withdrawn from domestic equity funds. A robust $1.4 billion was added to foreign mutual funds - the 6th consecutive week of positive inflows for this category. And as expected, another $5.4 billion went into fixed income. According to Lipper FMI, high yield bond funds received $347 million for the week ending October 20th, an increase from the previous week’s $240 million. As well, money flowing into municipal bond mutual funds more than doubled to $420 million. Stock market volatility remains at very low levels. The CBOE VIX index closed at 18.78 this week, similar to levels at the end of April. The Nasdaq VXN index at 20.42 is slightly higher, both nominally and relative to its April levels. The option market is not offering much insight. The ISE sentiment index which measures retail option trading sentiment fell slightly as the 10 day moving average of the equity only ISE call put ratio declined from 202 to 191 this week. This suggests that option traders lifted their feet from the gas peddle slightly but are continuing to buy almost twice as many calls as puts to open a trade. The CBOE put call ratio (equity only) similarly shifted higher with the 10 day moving average rising to 0.602 from last week’s 0.573. That is an equivalent of 166 calls for every 100 puts. In case you missed it, check out the previous post which goes into detail about gold’s current sentiment situation. Adding your site as a link specifically for this area, which I do not cover. Thanks much for this weekly report - one of the main reasons why i visit your website. PEJ, they are mirror opposites of each other as they have been for some time. The trick is that sentiment extremes can take some time to initiate a reversal. It can feel like you’re steering a cruise ship not a zippy seadoo. Thanks for the comment. Let’s say that I haven’t been steering at all, I’ve been quite busy on several side projects since late August. But you’re right, I’m also now getting frustrated by the action on the markets, and that’s not good.